I’m just back from a few days in Dublin, finding out about the work that’s being done to help people travel with hidden disabilities at the airport there and meeting up with some fellow EFID awardees at the Irish Dementia Working Group. With a little time to spare, I spent some time discovering the city, always on the look out for how local transport works. The first thing I noticed was the road crossings - we are often told about crossings that don't allow enough time to cross or that change from green to red very quickly. In Dublin an amber person appears as we crossed the road - I'm not sure if there's more time allowed but, if you were taking things a little more slowly, it might feel as though someone was on your side? I liked it. I took a local train through the city centre. It’s a good, regular service. At Connolly Station I noticed some staff helping people using wheelchairs board with a ramp so I asked them afterwards about assisted travel and if people needed to book. Some do, they said, but they don’t need to, just let us know when you arrive and we’ll help you on to the train. Sounds good. I headed outside to a bus station 5 minutes down the road and, with my toilets-on-a-journey hat on, took a look inside. As often happens (and we’ve talked about this in our project) people wonder why you’re lurking around the toilets, but not going inside. This was friendly Dublin though, where local people make the first move to chat. ‘Are you lost?’ the woman asked me as I peered at the sign to the accessible toilet. No, I said, just wondering what facilities are available. She looked a bit unsure. She had been waiting outside for a while apparently and yes, she explained, there’s only one 'disabled' toilet. I was just asking her about finding toilets along her journey (and she was starting to frown at me) when a sharp, loud beep started and a light flashed next to the door. We both immediately thought the same thing - the person inside had pressed an alarm. ‘I hope they’re alright’ she said, looking worried. ‘Open the door!’ a voice shouted from behind us. It didn’t make sense. We turned and someone in uniform was walking away from us. No explanation. The woman pulled on the door and it opened. ‘There’s nobody in here' she said. We exchanged a puzzled look - she had been waiting a while for an empty bathroom. Clearly a little embarrassed and frustrated, she disappeared inside. I looked again at the notice, which I hadn’t read closely. So, in order to use the 'disabled' toilet, you had to cross the station concourse about 100 meters away and ask. Or you had to be spotted - which clearly took a while. At the information desk there’s a button that staff can use to open the toilet door. Maybe it’s the one that they use if someone does press the alarm? ‘It’s to stop everybody using it’ the staff explained when I made the trip across to ask. Perhaps we should focus on systems that enable access, not restrict it. Something simple like a sign that tells us that the toilet is occupied would be helpful. 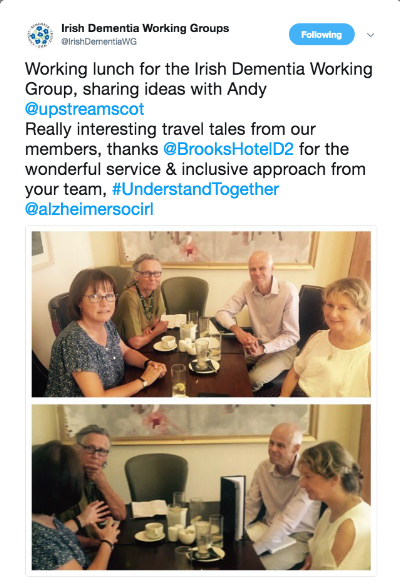 Later, when I met with the Irish Dementia Working Group, we had so much to discuss and share that I didn’t get time to tell this story, but we talked about the issues it raises. How sometimes the simple fixes can make the biggest difference ... and the fact that we need to consider how services make us feel? What about the person wanting - no, needing - to use the toilet. What’s the impact of this system on them? In this case, probably quite negative. We covered so much over the course of the afternoon and it was a pleasure to spend some quality time together, sharing experiences, opinions and ideas. Yes, we talked about designs and environment and the challenges of travelling with dementia, but we also talked about the need for action, for improvement, for a different approach to design and for real change at a local level, not just more talking. Let's hope we can find ways to collaborate to make some of this happen. I don't have toilets-on-a-journey hat by the way, but maybe I should get one.